This area of the Northern Cape province is truly the heart of the Kalahari. Here you will experience red sand dunes and dry riverbeds, wide open skies and flat-topped acacia trees that symbolise the Kalahari Red Dune Route. The mighty Kgalagadi Transfrontier Park, Africa’s first transfrontier park, comprises almost 3.7-million hectares of sparsely vegetated red sand dunes and dry riverbeds. It remains one of the world’s last truly unspoilt ecosystems. The park is the result of the unification of South Africa’s Kalahari Gemsbok Park and Botswana’s Gemsbok National Park. The reserve provides a sanctuary for herds of gemsbok, springbok, blue wildebeest, red hartebeest, eland, lion, leopard, cheetah and smaller game. There are also six upmarket unfenced wilderness camps that allow visitors to feel at one with the Kalahari. 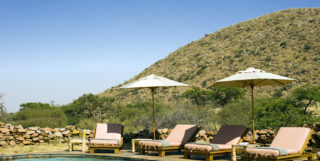 The Kalahari Tented Camp has 15 fully equipped self-catering units, sleeping two to four people, and a swimming pool. The camp overlooks a waterhole on the ancient Auob River. The Grootkolk Wilderness Camp is small and exclusive, only 20km from Union's End (this is the area where the Nossob River crosses from Namibia into the Kgalagadi Transfrontier Park). Once you’re on the main road dust-lining towards the gates of the Kgalagadi Transfrontier Park, a whole world of gravel awaits. 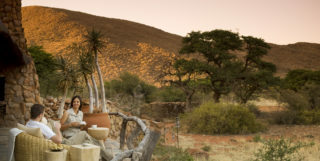 Comfortable lodges, rustic bush camps, traditional San villages and hospitable guest farms dot the arid wilderness. But, more than anything, you will be able to find peace and tranquillity here. Dorpies (small towns) are few and far between; look out for Ashkam, Hakskeen Pan and the Mier community. The Kgalagadi Transfrontier Park is undoubtedly the premier attraction here. Few things can beat the feeling of queuing at the gate for the morning game drive, with the first rays of the sun streaming over the eastern horizon. You might encounter martial eagles puffed out against the morning chill, wildebeest snorting plumes of vapour into the freezing air, or the deep bass rumble of a black-maned lion proclaiming its territory from a high dune. This is a place like no other. Get your dose of a natural high at the Kalahari Trails Private Nature Reserve, regarded by many as the best-kept secret in the Kalahari. Situated 35km south of the Kgalagadi, the reserve is run by Professor Anne Rasa, who is a real legend in these parts. The remote bush camp enables you to escape into the heart of the dunes. Hike with her and her meerkats by day to “read the dune newspaper” or track scorpions and wind spiders at night. The Kalahari Red Dune Route brims with cultural activities offered by the ‡Khomani San people. Activities range from a stopover at the magnificent !Xaus Lodge to the ǂKhomani Cultural Landscape (a bushmen living museum), where you can learn to shoot a bow and arrow and how make fire with no lighter. A great family stop en route to the park is Rooiduin Guest Farm. This is a typically earthy and no-nonsense Northern Cape adventure destination, where the kids (and any young-at-heart adults, of course) can enjoy an afternoon of play and sand-boarding on the ochre dunes. You may be excused if you momentarily mistake the Molopo Kalahari Lodge for a mirage when you spot this oasis next to the desert highway. 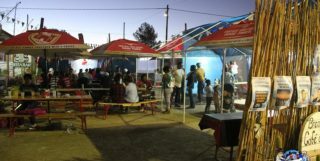 Less than an hour from the Kgalagadi Transfrontier National Park gates, it is the perfect place to take a break, either for an ice-cold beer or a night of luxury. The Kgalagadi Lodge offers a secure environment for the kids to run around in. Only five minutes from the park, it is a great option if you want to be in the park by sunrise. Try the local delicacies of sheep’s tails and nabbas (Kalahari truffles). Kgalagadi Transfrontier Park – This park is a must-do when touring the Kalahari Red Dune Route. It offers visitors stunning scenery, game drives on which a variety of wild game can be spotted, and a once-in-a-lifetime chance of camping under the stars. For more information, contact: +27 (0)54 561 2000. ‡Khomani Cultural Landscape – Gain first-hand experience of the lives of the ǂKhomani San people who still lead their nomadic way of life. The ‡Khomani Cultural Landscape is both a living museum and a Unesco World Heritage Site. 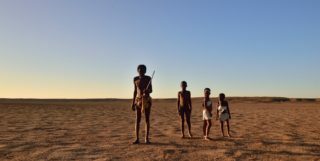 Here visitors will come to understand the #Khomani San people and their culture as hunter-gatherers, their worldview, and their deep understanding of the natural environment – all of which have allowed them to adapt to harsh desert conditions. For tour bookings, contact +27 (0)87 285 4299 or email bookings@khomanisan.com. Vinkie’s Kalahari Experience – Vinkie’s Kalahari Experience offers tailor-made tours to visitors who would like to enjoy a bush experience. Activities include tracking, bushcraft, craft making, tasting traditional foods, and hunting with a bow and arrow. For bookings, contact +27 (0)72 977 0120 / +27 (0)82 785 1600, or email bushcamp@kalaharivinkie.co.za.